State Sen. Jim Kastama at the Washington Research Council board meeting Tuesday, held at the Washington Athletic Club. SEATTLE, April 25.—Fellow Democrats told Jim Kastama he had cooked his own goose when he cast his vote this year with Republicans and turned the Senate upside down. But in his first major address since the dramatic upheaval last month in the state Legislature, the Puyallup Democrat said he has no regrets. In a speech Tuesday to the board of the Washington Research Council, Kastama offered his most detailed explanation yet for the dramatic parliamentary maneuver that took place on the Senate floor March 2. In a political system that seemingly has no room for moderation, Kastama said that breaking ranks is something you have to do – and he just wishes it happened more often. Together with Democratic state Sens. Rodney Tom and Tim Sheldon, Kastama cast his vote with the 22 Senate Republicans on a budget bill and threw control of the chamber to the opposing party. The rarely-seen cross-party vote was the turning point of this year’s just-finished legislative session, and a decision Kastama likened to “crossing the Rubicon.” There was no return. Today Washington State Wire presents the full text of Kastama’s speech, which offers plenty of detail that hasn’t yet been reported. Kastama, who is running for secretary of state this year, said the vote made him an outcast. 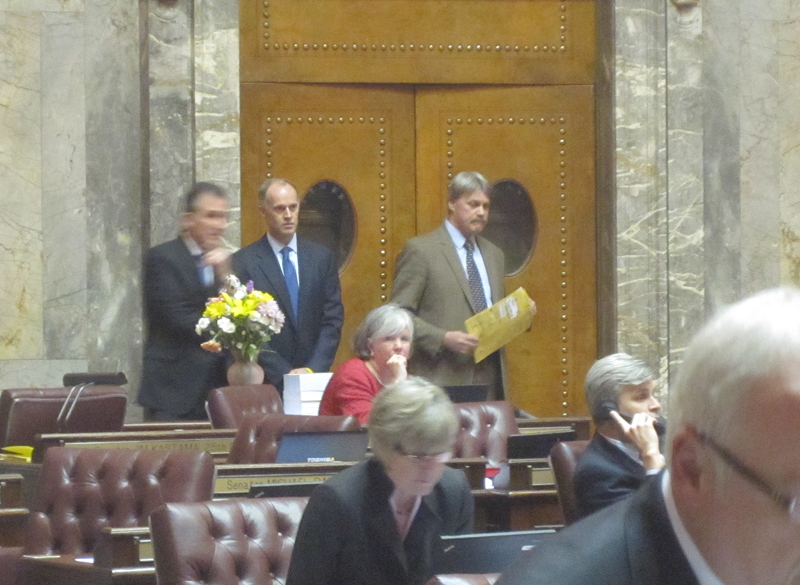 His Democratic colleagues told him he’d never work in Olympia again. One informed him that the only job he’d be likely to get was as a gas-station attendant. His session aide tearfully begged him to change his vote. Yet the end result, a month later, was a spending plan negotiated between the Senate coalition and the Democrats who remained in control of the House, passed by one of the strongest bipartisan budget votes ever witnessed in the Senate. Not to mention a few reform measures that may reduce the skyward trajectory of state spending and reduce pressure for big tax increases in the future. It can be a bit lonely being a man in the middle, Kastama said. But what he kept thinking about was the scene this year in the Ways and Means Committee as citizens came forward to testify about the impact of this year’s budget cuts, and he realized that if the Legislature didn’t change course and make dramatic changes to state spending patterns, they’d be back again next year saying the same thing again. “As the testimony became tearful, I turned to look back at my colleagues to gauge the impact, only to see them checking their emails, reading and seemingly disinterested. Sens. Kastama, Rodney Tom and Tim Sheldon watch from the rear of the Senate the night they turned the chamber upside down. “Or you can take the story of a Republican and a Democrat walking down the street who encounter two poor men. The Republican hands one of the poor men a business card, says, ‘come to my business and I’ll give you a job,’ and gives him $20. The Democrat approaches the other poor man, points him in the direction of the closest welfare office, leans over and takes $50 from the Republican’s pocket and hands it to him. “Regardless of what one might think about Democrats and Republicans, the tension between the parties now approaches that of the Montagus and the Capulets, the Hatfields and the McCoys, and the Raiders and the Seahawks. “In football, the fanaticism has grown to the point that any penalty one’s team gets, no matter how deserved, is considered a ‘bad call.’ That same ‘sports mentality’ of our team, right or wrong, has taken over politics. It’s dogmatic. “In some small part I believe it has to do with how we redistrict every 10 years. Despite what you may hear about a bipartisan objective process of reshaping legislative districts to match population growth, the process is designed to solidify incumbents, and consciously create just a few focused swing districts that moderate candidates can emerge from. “Extreme partisanship is also enabled by the concentration of campaign contributions along clear special interest lines. Let’s face it. In most cases money dictates your political viability. Newspapers track contributions, with headlines and photos going to those candidates who have raised the most money. For Democrats, that money has steadily come from labor unions, teachers, trial lawyers and public employees. For Republicans: from businesses, insurance companies, pharmaceutical companies and agribusiness. “There is very little electoral cash reward for being a centrist or working across party lines. There is no interest group looking for people who can bring both sides together or to actually reward those people who are problem solvers. “No, if you’re interested in donating your hard-earned money to a political candidate, you usually have a narrow interest, and you want to win. “First, they are usually elected from a suburban ‘swing district’ that has shown a willingness to elect both Republicans and Democrats. “Second, they rarely impress any interest group. Even when one thinks they are doing well on certain issues – business, child safety, labor – they are usually in the middle of the pack, the better of bad choices, but never considered ideal. As a result, raising money is difficult, and therefore one usually has the political lifespan analogous to that of a common housefly, is what I say. “Third, no matter how well you get along with the opposing party during the legislative session, each election is a bloodbath. I, for example, routinely get 15 hit pieces against me in an election, even with a weak opponent. “If one wants to be effective as a moderate, one needs to work across the aisle in Olympia, but not get lulled into thinking that ‘collegiality’ will transfer into a soft campaign season. “And if after a brutal campaign one returns and is full of vengeance, I share with them the other secret to success. Shake it off. Start working with the very same people who were against you. Remember what Warren Magnuson said. The secret to politics is a short memory. “So it’s with that context I’ll discuss this last session. “After a roughly $5 billion budget shortfall in 2011, Washington faced an additional $2 billion deficit. Although a smaller deficit, the solutions of bridging this gap were getting fewer and more contentious. “The governor called a special session in December to reconcile this difference with a series of budget cuts and a tax package. A small budget reduction bill was passed, punting the big problems until January during the regular session. “Overshadowing this crisis was the success of a small group of Democratic legislators, self-proclaimed ‘Roadkill’ moderates, who had successfully reformed the workers’ compensation program and unemployment insurance and had forged a bipartisan budget agreement in the Senate the session prior. “Now, just for the record, my Mom hates the name ‘Roadkill.’ I mean, who raises their kid to be called that? But given the characteristics of a moderate centrist I outlined a minute ago, the term is fitting for those who are too often run over by partisanship. “This group, along with a growing number of legislators, had become more aware that our budget deficits were growing out of control; that the 2007-09 recession was a fundamental shift in the global economy; that each new budget cycle would include larger deficits; and that fundamentally, despite a 4.5% increase in annual tax revenues, Washington’s budget was not sustainable. Non-partisan staff even estimated that the deficit would climb to as high as $3 billion a year by 2017. “Because of this awareness, the standard mantra became ‘Reforms Before Revenue.’ If the House or Senate wanted a revenue package to go before the voters, then long-term reforms needed to be implemented first to get the votes of the Roadkill. “Eighteen different reforms were put forward by the Roadkill members. These included a 6-year constitutional balanced budget amendment; charter schools; pension reforms; stormwater regulatory streamlining; health care reforms; and major agency restructuring. “Now, the likelihood of all these passing was questionable, but nevertheless, each was tracked daily and meetings were held on a weekly basis to discuss their progress. “But then something unexpected happened. In February the revenue forecast came with an unexpected increase in revenue. The caseload forecast – student levels, prisoners, public assistance recipients – shrunk. The net result was a positive $400 million dent in the deficit. “Something else had changed, too, probably due to one of your polls. Behind the scenes, polling was showing that voters were not in the mood to vote for taxes. The highest level of support was approximately 55% for a sales tax, but that was before any negative ads, which meant doom for such a proposition. “As evidence, with less than a week to go in the session, not one reform had been signed by the governor. “It was around this time that Joe Zarelli, the chief budget writer for the Senate Republicans, approached me with the idea of presenting an alternative budget, one that would balance into the future, include structural reforms, have a healthy reserve, and put the Senate in a good position to negotiate with the House. “My first thought was, ‘That’s gutsy.’ You see, usually minority parties just hide behind a wall and throw bombs at the majority’s budget. They don’t offer their own version, only the assurance that if they were in the majority, they would have a better budget. Democrats, Republicans – they both do this. “I had grown to trust Joe over the last 10 years or so. I had seen him offer perfectly good amendments to the bills on the Senate floor, only to have them defeated by my colleagues. The moderates would often stand in the back of the chamber and ask “what’s wrong with that amendment? It seems like a good idea,” only to be told it wouldn’t pass in the House or it wasn’t our idea. “Each year, Joe would give his annual speech about the unsustainability of the budget and each year, we would ignore it. It wasn’t until I actually sat on the Ways and Means committee that I realized he was right. “But what finally clinched my trust with Joe was the writing of the 2011-2013 budget, when he agreed to closely work with Senator Ed Murray. Polar opposites on many issues, Joe worked to forge the most bipartisan budget that the Senate had seen in years, at least until this latest budget. He didn’t have to work with Ed – instead he could have let the Democrats implode over our disagreements. But he did. “The only problem was, with just 6 days left in the session, and not enough votes to bring any budget out of the Senate Ways and Means Committee, a rarely used procedural motion would be used to bring the budget to the floor of the Senate for a vote – the 9th Order. “At this point, imagine an organ playing Boris Karloff horror music, and a loud scream – that’s basically the 9th Order. “For those of you who are not familiar with it, it is a procedural motion used to bring any bill to the floor for a vote, even a bill that has been deliberately squashed by the majority party in charge. In essence, 25 votes take over the Senate floor. It is a coup that only happens once every 4 to 5 years. But regarding the budget, only once every 25 years. “Now, full admission, this wasn’t the first time I had considered going to the 9th Order this session. I had grown impatient with my party’s resistance to charter schools. Even recent polling had shown that over 50 percent of Democrats supported the concept. It was time to bring this type of innovation to our state. However, a disconnect happened. As a separate bill to move teacher evaluations moved forward, many of the Roadkill members were led to believe that the teacher evaluation bill’s passage and signing into law was in exchange for the defeat of the charter school bill. Not willing to acquiesce to this arrangement, I pushed forward. My frustration grew greater when I learned that the extent to which these teacher evaluations would be used in personnel decisions would be subject to local collective bargaining, meaning they may never actually be used. I also later learned that no such exchange for the charter schools bill actually existed. We had simply lost an opportunity. “But there were doubts that there were enough votes. Pam Roach was a question. Also there was a rumor that Cheryl Pflug might side against the coalition. “To quell that rumor, I decided to visit Senator Pflug. I am ashamed to say that I should have done it much earlier. I, too, let partisanship stand in the way of a constructive relationship. Talking with her for an hour or so, I sensed the frustration from a moderate on the other side of the aisle. We both went through the budget, making some small modifications that would make it more palatable. “I left feeling guilty that Roadkill had not included Republicans and that I had not put more energy into developing a new group, perhaps called the ‘Third Way,’ where all centrists could feel welcome. “For those curious we developed the following mission statement from that meeting. The Third Way is a bi-partisan coalition committed to redefining government for the 21st century through innovative, pro-growth economic reforms and common sense accountability. “Now back to the 9th Order. So after many fits and starts, on Friday, March 2nd, six days before the end of the session, at approximately 3:30, a motion was made to go to the 9th Order. “The hallways outside the chamber emptied and filled the balconies. People came to see a once-in-a-quarter-century event. Parliamentarians scrambled. The collective noise of the pages in our Little Red Books being flipped was almost audible. “Alphabetically my name came first for the 9th Order, followed by Democrat Senators Tim Sheldon and Rodney Tom, all voting aye with 22 Republicans to bring the budget to the floor of the Senate. “After an attempt to adjourn, a motion to recess for the purpose of caucus was made by the Democrats and denied – by the way, probably the first faux pas of the evening in the etiquette of 9th Order, if there is any etiquette. The ability to collect oneself and strategize is a courtesy that should always be extended and it wasn’t. “The Democrats retaliated by having the budget read out loud, word for word – a privileged motion that only needs one member to request. “After an hour of reading, and arriving at page 22 of a couple-hundred-page bill, members finally agreed to a truce and went at ease to caucus. “My colleagues made it very clear to me that my career was over. ‘The only job you’ll ever get is as a gas station attendant,’ one member said. “In the wings, my session aide for 11 years and family friend pleaded with me to change my vote, with tears in her eyes. “What they didn’t understand was that in my own mind, I had crossed the Rubicon, the point of no return. “My journey to this point was a long one. It started with efforts to instill management and performance programs to improve the outcomes of state agencies, only to see these programs half-heartedly implemented, or vetoed by the governor. “My proposal to use the federal BRAC, Base Realignment and Closure Commission, model of a binding independent commission to restructure state government, called the ARROW Commission, too, was vetoed by the governor – twice. “Sitting on the Republican side of the Senate chamber also inched me forward. Because there are more Democrats than Republicans, most freshman lawmakers are put on the Republican side. However, as is usual fare, the first chance they get to move back to the Democratic side, they bolt. I refused to do so. This has allowed me to build relationships with Republican members, know their families, children, discover common ground and trust. “The final linchpin for me was during a Ways and Means Committee hearing when a group of citizens testified against the proposed budget cuts. As the testimony became tearful, I turned to look back at my colleagues to gauge the impact, only to see them checking their emails, reading and seemingly disinterested. “My colleagues knew that these individuals would have to come back year after year, begging for their services to be preserved, because our budget was unsustainable. I found that cruel; I found that unacceptable. I thought back to all the reforms I had tried to pass, all the tough decisions I kept waiting for someone else, the governor, or my party to make. And I came to the conclusion that best reform is just to govern. “There is a time to campaign for what we want, and a time to govern with what we have. “I had crossed the Rubicon. “Twelve hours later, Saturday morning, the Senate finally adjourned, the coalition budget intact, unscathed, with 25 solid votes. “What happened from that point was more like the Cold War. Originally, the coalition had hoped that negotiations would take place with the House and that a budget compromise, with necessary reforms, would be in place by next Thursday, the final day of the session. “We had made very clear the budget we passed was not the ideal budget. We believed, as was eventually proven, that it was a successful negotiating document to get us where we wanted to be. Our focus was the end result. “Instead of negotiations between budget writers, silence. Even a letter sent by the Republican minority leader, Mike Hewitt, requesting negotiations, was not shared with all of the Democratic leadership team and only made known on Wednesday after I had countered assertions that the coalition was stonewalling or using the disarray as a political ploy for next fall’s election. “Likely due to the perceived concern for my secretary of state’s race, I bore the brunt of the onslaught. About 8,000 emails flooded my office within days. I received thousands of negative form letters. Blogs used profanities I had rarely seen used. Daily, I would receive a voice mail from one senator, castigating me harshly, pleading for me to leave the coalition. My colleagues seemed to believe that somehow with fire they could woo me back into the fold. 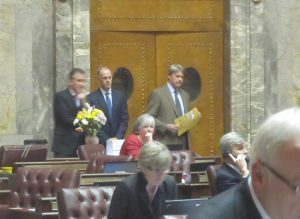 “Unable to reach any agreement, the legislature went into a second special session, scheduled to last 30 days. “The Cold War continued. For all of our sophistication as legislators, it amazes me how peer pressure turns otherwise intelligent people meek and disempowered. “For example, a legislator from the House approached me about working on the 4-year balanced budget legislation. I said that would be fine. I would arrange a meeting between us and Joe Zarelli, the senator I had written the bill with. The negotiator immediately flinched and said such a meeting was impossible. ‘I would get killed if I was seen anywhere near him,’ is what he said. “Frustrated at the lack of progress, the coalition held a press conference on March 15th and put forward a new version of the budget, one that would restore funding for K-12 and higher education and fully fund pensions. The thought was that this version would closely represent an imagined budget, had it actually been negotiated between the House and the Senate. “But implicit in this presentation was the assertion that if negotiations didn’t begin soon, the coalition would bring the budget to the Senate floor and vote it out, using the 9th Order again if necessary, which of course would probably be the only time in our state’s history that it had been used twice on a budget in one year. “The following Monday, negotiations started, with budget writers meeting for the first time. With just 6 days before the end of the special session, the House and Senate convened. “At times negotiations came to a halt, even went backwards, but on the last day, Tuesday, at 12:30 pm, negotiators met in the governor’s office for one last attempt. Everything had boiled down to a few reforms passing. Many reporters had printed the obituary of the special session, but I still believed there was the chance we could actually finish on time. “Bolstered by positive editorial boards from around the state, the coalition made it clear that a third special session would be acceptable, if not necessary, to ensure long-term reforms were adopted. “As the night wore on, the walls of resistance started to crumble, and there was hope that we would finish. Frankly, my colleagues had never spent this much time on a budget before, and were fatigued and willing to compromise to get out of there. “Every way to avoid going into a third special session, technically, was thought of. We thought of draping a cloth over the clock to pretend we didn’t see it; actually cutting the power, or stopping the clock so as to freeze time. Now, these old strategies hit roadblocks as today computers time-stamp everything, making plausible deniability, well, just not plausible. There would be no way to avoid it. We were going to go into a third special session. “What happened next, in a mere matter of hours, was historic. “Agreement was found on a 4-year balanced budget bill that would prevent [future] legislatures from punting expenses into the next biennium. “Agreement to eliminate I-728 had occurred, the unfunded initiative that added almost a $ billion to our deficit in each budget cycle. “Agreement on pension reform. By limiting early retirement options for new employees, and lowering the assumed rate of return, the state would save $1.3 billion over 25 years. “Agreement on a way to consolidate health care plans for school employees, finally bringing transparency to overpriced health care. “Agreement on a jobs package for 18,000 jobs, that required Republican votes. “Agreement to close the loophole on out-of-state banks, which again required Republican votes. “And agreement on a budget, which garnered 44 Senate votes – the most anyone has ever seen in our state. 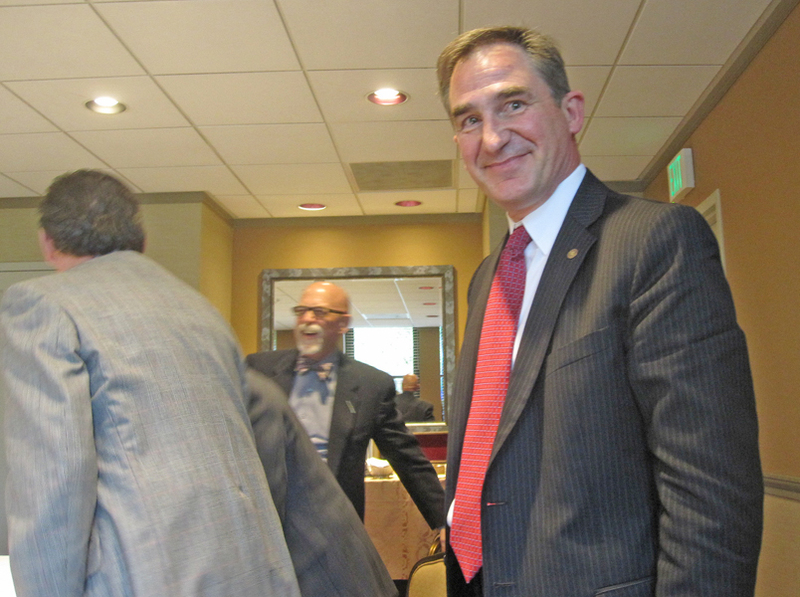 “‘Forced Bipartisanship Paid Dividends in the State Budget,’ Tacoma News Tribune. “‘State Budget a Triumph of the Middle,’ Seattle Times. “‘Long-Needed Budget Fixes Made at Last,’ Spokane Spokesman-Review. “Now, before you accuse me of giving too much credit to the coalition, let me be clear about the shortcomings of the reforms we put in place. Each one is imperfect. For example, the public school health plans should outright merge the plans into one large purchasing unit. The bill instead requires that all costs and benefits be reported; that plans provide equity to non-teachers; that if a school districts doesn’t comply, they are immediately put into the state plan with dramatically lower rates. Granted it is not ideal, but it is a good compromise. 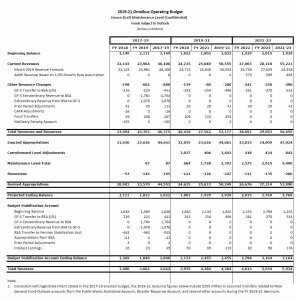 “Even the 4-year budget legislation does not assure wise behavior, because it exempts the McCleary decision from expenses required to be taken into account. “And deficits are not a thing of the past. My non-partisan staff indicates that the deficit next session could start as high as $300 million. The Research Council’s own policy research projects that with the McCleary decision and the need for a prudent reserve, that deficit could reach as high as $1.7 billion. “In other words, there are plenty of hard decisions yet to make. And this is what I find the most frustrating about the last legislative session. Rather than it being an anomaly to the way things work, a once-every-25-year event, it should become the standard way we conduct business. Big decisions require leaders willing to put aside the special interests, their party interest, and their own interest, to work in the common interest. “Now, some may believe that this change will occur only with a change in political parties. On certain policies it may. But it cannot be assumed. For example, Nick Hanauer thinks that by supporting Republicans, he can finally get charter schools. In reality, this may harden the Democrats against them, leaving all the votes to come from the Republicans, which is doubtful. “In my opinion, both parties need to be internally disrupted, but not from the extremes, from the middle. “Somehow, more moderates need to be elected. “I have some ideas for accomplishing this. “First, I think we need to begin the process of redesigning legislative districts to be more competitive. We have almost eight years to work on this before we must redistrict again. Let’s make legislative races the battleground of ideas, instead of the spawning ground for narrow interests. “Second, as much as this may give many of you heartburn, a dynamic process of publically financed campaigns would begin to remove the incentive to secure campaign contributions. On this topic, let me tell you that those who oppose this the most in the Legislature happen to be those interest groups from all sides of the political spectrum, Democrat and Republican, which should give you reason to pause. “Finally, we joke about the name Roadkill, but it is called that for a reason. Their success demonstrates there is a viable middle, but our campaign contribution system is not aligned with it. “I propose that some entity develop a ‘moneyball’ strategy for politics. Now, if you haven’t seen the movie, I suggest you do. It applies a simple algorithm to baseball to let data drive the results. As long as the total batting average, an objective factor, of your players exceeds that of the other team, you should theoretically win. “Applied to politics, someone needs to develop an algorithm for politics to determine who really is a moderate, who will reach across the aisle to solve problems. Co-sponsorships of legislation; crossing party lines; endorsing candidates from the other party – all these could all be factors used in this determination. “Being a moderate is not a marketing label, as some often use it, and I see every day. It’s a philosophy and as such it should be able to be determined by data. “In conclusion, I spoke at a conference for the Technology Alliance last summer. During Q&A they asked me how we could get real, substantial change in government. I concluded by telling them that just 10 to 15 leaders could change the face of government in our state. They must be committed to looking for the best public policy, not political party, they must work together, and finally, they must agree that the decisions they make, given our current political structure, will most likely get them unelected. Those are the people we need. “People in this room could help elect these leaders. And Washington will be grateful.